WATCH MORE THAN FOUR EPISODES. I don't normally write reviews, but I feel like I have to for this one. THIS SHOW IS WORTH WATCHING. YES IT STARTS SLOW, DEAL WITH IT. GIVE IT A FAIR CHANCE. DO NOT JUDGE THE SHOW UNTIL YOU'VE FINISHED IT. Seriously, so many people dropped it early and missed out on arguably one of the better shows of the 2015 Fall season. STORY (9): It starts off slow and kinda generic. You've seen it before, the big bad greedy corporation wants to cut funding for the hardworking dedicated student team finishes their big project. Corporate representative is sent to be evil and shut them down. Snore. Except that's now what the story is about. The classroom is just a single plot point to carry the show onto the next event, as it starts to pull the camera back to show what's going on with the behind the scenes. It evolves into a corporate and political drama where alliances are formed behind closed doors and plans are carefully laid to move everyone into positions. The story may be about kids building rocketships, but the show is a much more grand scale. Then you get gut punched by the intense moments, when the trap cards are activated or the action kicks off. It's just at the right level that you stay intrigued during the "slower" parts. Art/Sound (8): It looks and sounds good. I'm not really going to go in depth on it because I don't know what else to say. The animation is smooth, the art is well done, the backgrounds are gorgeous, and the effects are nice. There aren't any out of place sounds and the OP/ED are nice. Character (8): This is where a lot of people get confused. "Why are there so many characters, who's the main character, why aren't these people getting more attention?" Whoa there speedy, calm yourself down. There isn't what I consider a single "main" character, it's more like two primary characters, two secondary, and the supporting characters. Kaito is the MC of the classroom side, while Nagisa is the MC of the corporate side. Both are important, and there's a solid overlap between them to where it never feels like one is taking the spotlight from the other. Iris and Mizuki both get good development and fill their rolls nicely. I'll warn that if you hate amnesiac characters with a burning passion it might take a little away, but it's not a critical plot point to the overall story. The other students do what they need to and don't get in the way. Romance is implied (and shown) but not plot critical, just enough to get you intrigued but not so much that it detracts from the story. Enjoyment (9): Honestly, it's one of the better shows this season. Once the plot got underway I was addicted. The pacing was excellent, the excitement was real, and it ends almost perfectly. All important plot points are wrapped up nicely, though there's just enough hooks that a second season can latch on to. Overall (9): I'll admit I'm rating it a point higher than it probably deserves, but I really wanted to counter all the negative reviews. 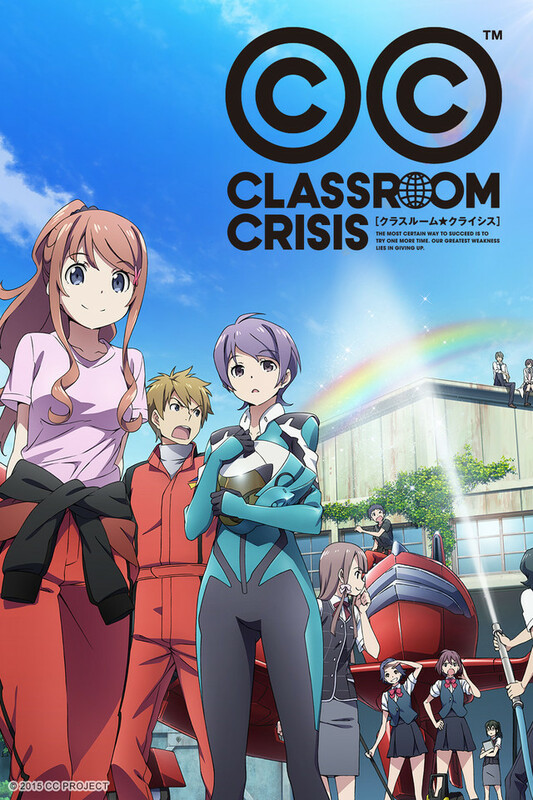 Classroom Crisis is a very well done original work that absolutely needs more attention that it got. The slow start really hurt viewership and I feel it's unfair considering just how good the show ended up being. Seriously, you won't regret it, I promise. A Beautiful Anime with a thrilling story? A would be 5/5 if only it ended well. Right on the first few episodes we get an introduction of all the characters, and a sense of a greater underlying story. They give the main characters a great amount of screen time and backstory. I am watching this as it simulcasts so my final verdict may be a little different depending on the ending. However if you are looking for an anime with a well written story, a certain degree of emotional impact, and love...? (Mizuki x Nagisa pls) then this is the anime for you. UPDATE: This review was written half way through the story, and it definitely didn't end as smoothly as I had hoped so I'll drop it to 4 stars... Not sure how but I'd give the series a 3.5 instead of 3. WARNING : Try to watch the first 6 episodes before dropping the series. To me, this show isn't like the "typical" anime you see now these days. One where you have an average male protagonist, not good at anything but not necessarily bad; then one day a mysterious girl appears who captivates him, they have a meaningful encounter then by the end of an episode she is apparently the new transfer student or something. Ensue harem with childhood friend, tsundere girl, ditzy princess you know what I mean. My point is, this painfully predictable formula has become the mainstay for mainstream anime these days and its refreshing to see any show that deviates from it. Of course this show has some cliche's but, every anime does in one form or another. The fact that they chose to incorporate themes like economics, business management and sic-fi (I'm a little biased because I'm interested in all those things) show they are not trying to take a typical "safe" route. Bonus points for not going straight for a harem route, despite having a majority female cast. My main gripe is that they could develop their characters a bit faster. I doubt this will be a long-running series (I hope I'm wrong) so I want to get the most out of it. They've established the personalities of the main cast, but haven't really gone into detail as to why they are that way (except for the two male leads). The best part of the show is its attempt for realism, by that I mean many show show you high school students piloting cool space ships and using all these cool gizmos and gadgets to fight or race. But I've never seen one that goes into depth about the financial and economical side of those miraculous machines and the work that goes into making them. It makes you ponder how much something like a gundam or evangelion would cost to make. I've enjoyed the past 5 episodes I've seen so far. I have a few problems with the pacing of the main narrative and a few specific events, (like when half the class leaves and then just comes back like nothing happened! What was the point of leaving if you all were just going to come back at the same time?) but overall I think this show is worth watching. Not the story the title suggests. Corporate Crisis? There are a number of anime who receive titles that cause viewers to go in with certain expectations only to find the anime is about something different. Classroom Crisis is definitely one such series. It is an anime that uses one tale as window dressing to tell it's true story. Much like Spice & Wolf or Maoyu Classroom Crisis uses the story of A-TEC's struggle to survive as a vehicle to delve into the corporate world; it's rules, it's quirks, and behind-the-scenes boardroom intrigue. Let's just say that when an accounting crisis can bring you to the edge of your seat you know the writers must be doing something right. I want to mention, based on the early episodes a lot of people hate Nagisa. To that I say good, you're not supposed to like him. His role isn't to coddle the members of A-TEC but to instruct them and instruct them quickly how to navigate the shark-infested waters of the corporate world because if they don't learn they'll never save what's precious to them. Space, Corporations and Excellent Characters! This show proved to be the biggest surprise for me this season, one which I'm happy to say ended very well. I won't bring any spoilers beyond the general trends of where the episodes head. The first few episodes give a very strong slice-of-life comedy drama vibe. It seems like that will be the trend for the whole series, which would make it a rather simple, "done-before" anime. However, even from the very first scene, the writers slowly began to change the trajectory of the story. Bits and pieces and hints are strategically placed and begin to grow: corporate intrigue; complex backstories; mysteries and secrets; hidden parts of character personalities; and so on. They continue to build up until they start to reach a tipping point, which drags the whole show into a new direction. With a well-placed twist and glimpses at deeper characterization, the show is brought to a good climax and ends on a hopeful note for a second season. It should be noted that this is very happily free of a lot of over-used and aggravating tropes. Nowhere do we see some of the romance tropes that make the reader sigh of disappointment, nor do we have horribly annoying characters. Even the presence of some tropes are used for humor, and work well enough. While this isn't an incredible masterpiece, it certainly is a good show. I give it 5/5 stars for the sake of being a show I thoroughly enjoyed watching, and hope eagerly for a second season. On a personal level. I enjoyed this showing completely. Tho I understood the anime, I feel others might have some trouble's. Specially in the beginning, and I am rather sad that anime itself doesn't explain a few things, but it didn't leave me asking more questions, so I suppose that is a good thing. I lied the ending, tho I think there should have been more character development in one of the main characters, event tho it does show some in the very end. I just wish there was a bit more. But I would recommend this anime for a weekend watch with a friend. Rather good story arch as well. And over all I have no problems with it. Surprisingly this show isn't the typical flashy anime. It has a lot of story building and makes you think twice about what is going to happen. You only wish for the best in this show but at times it seems like it isn't going to get any better. Watch the show to see how surprisingly nice it is.